Huawei may have already impressed us with the P20 Pro, however, the Chinese giant is now gearing up to launch its Mate flagship series to surprise us even further. The rumor mill has been chatting up the device on the Internet and we have now got a first look at Huawei Mate 20 Pro via a leaked live image. Thanks to a Chinese tipster over on Weibo, you can scroll down a little to check out the purported live image of the high-end variant of the Mate 20 series – Huawei Mate 20 Pro. 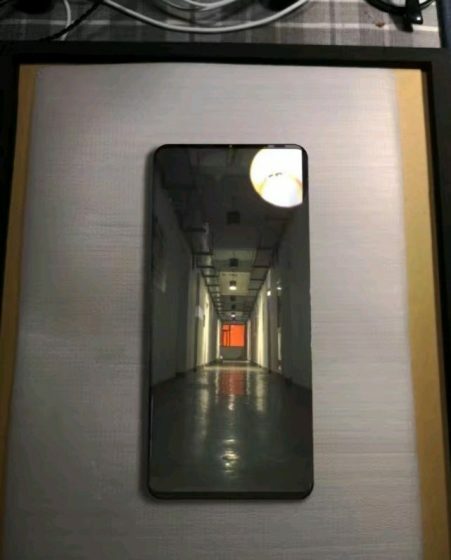 You can see in the image attached below that the device is expected to feature a dual edge curved screen, similar to the recent Galaxy S series phones. In addition to the live image, the Chinese tipster has also shared with us some key specs for this device. The Huawei Mate 20 Pro, as you can see, sports a huge screen but almost negligible bezel on all sides. This will give the device an impressive screen-to-body ratio, something most buyers would be in favor of. The device is expected to be powered by the upcoming Kirin 980 SoC, an ultra-sonic in-display fingerprint sensor from Qualcomm, GPU and CPU turbo technology, along with a triple camera system — similar to what we have already seen on the P20 Pro. The tipster has also revealed that the Mate 20 Pro will feature 40W fast charging, but we don’t know the exact size of the battery just yet. Also, the tipster says that the Mate 20 Pro will retail at an expected price of 5,000 yuan (approx Rs 49,990) in China. The Mate 20 Pro is the successor to Huawei’s Mate 10 from last year, which was in itself a great flagship, to begin with. Thus, we have got high expectations from the Mate 20 series and I’m happy to see that Huawei is not giving in to the notch trend. There is currently no way to confirm the authenticity of this leak, so we suggest you take it with a grain of salt.